On July 25th, 2012, the Inter-American Court of Human Rights delivered a historic ruling in the case of the Original Kichwa people of Sarayaku, who brought suit against the Ecuadorian State in 2003 for unauthorized oil development that violated their human rights. The ruling is a much-anticipated and gratifying end to a decade-long legal struggle to redress 15 years of destructive and unjust activity. The ruling could also have far-reaching impacts throughout Latin America, including the new round of oil concessions currently threatening the territory of our indigenous partners, the Achuar. In 1996, the Ecuadorian government gave concession of oil block 23 to the Argentinean General Fuel Company, also known as Compañía General de Combustibles (CGC), affecting 60% of the territory of the original Kichwa people of Sarayaku. This concession occurred without any process of informing, consulting, or obtaining consent from the Sarayaku people facing the development of oil activities in their territory. The people of Sarayaku have consistently maintained their rejection of oil activities in their territory, based on the enormous negative impact on their sacred lands, their quality and ways of life, development, spirituality, the Amazonian environment, social peace, and the integrity of the community members. These camps were built in the middle of the jungle, where the invasion of CGC and the armed forces was taking place. This decision entailed grave risks for the life, integrity, health, nutrition, education, culture and spirituality of the Sarayaku community members. According to official information from Ecuador’s Ministry of Energy, CGC placed charges of pentolite, a highly destructive explosive, throughout Sarayaku and Achuar territory without prior consent or knowledge of the local population. In total, more than 3,000 pounds of explosives were abandoned 40 feet below ground in the sacred jungle of Sarayaku, and an unknown quantity left on the surface. Many popular spots for hunting by men and gathering by children are compromised to this day. The Ministry of Energy warns that pentolite is highly dangerous and that the charges can accidentally and easily detonate. Beginning in May 2003, the Inter-American Commission on Human Rights put forward numerous injunctions and provisions in favor of the life and integrity of the Sarayaku community and their special relationship with their territory. The Ecuadorian government systematically ignored these measures, and allies of CGC arbitrarily blocked the Bobonaza River, which passes through the Sarayaku territory, in order to pressure the community members to desist in the legal actions undertaken and to begin direct negotiations. In June 2005, the Commission ratified expanded measures, which incorporated a disposition that the explosives left by CGC in Sarayaku’s territory be removed. In December 2007, the Ministry of Mines and Oil began steps to remove the explosives. Two years later, they had retrieved only 31 pounds of explosives–just over 10% of the amount estimated to be in the ground. On May 8, 2009, the Ministry of Mines and Oil authorized, without consultation, a new opening of oil operations in blocks 23 and 24, spaces in which the Sarayaku people, as well as the Shuar and Achuar nationalities, have opposed exploitation since the end of the 1990’s. These are also areas that are sheltered under decisions of international human rights organizations. Even though CGC did not taking part in the restart of these activities, the new oil opening demonstrated the fragile situation of the Sarayaku case. In January 2010, the Inter-American Commission on Human Rights released their resolution on the case to the Inter-American Court of Human Rights for a final ruling. A delegation of about 20 people from the community of Sarayaku – including leaders, men, women, elders and children - traveled to San José, Costa Rica in early July 2011 to testify about the human rights violations perpetrated on their communities by both foreign oil companies and the state. The hearing was important for the Sarayaku people, as it was the only opportunity to present their oral allegations, testimony, and expert evidence to the judges of the Court. 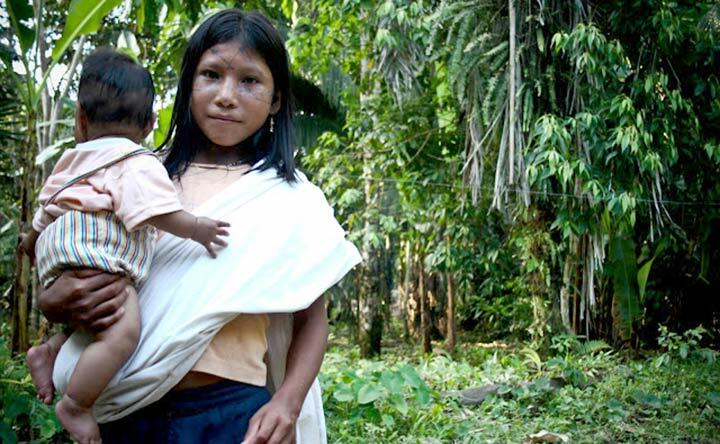 In April 2012, a delegation from the Inter-American Court of Human Rights visited the Amazon rainforest community of Sarayaku in Ecuador, the first-ever on-site visit of the Court to an indigenous territory. During this visit, the Judicial Secretary of State of Ecuador, Alexis Mera, offered the community a deal to repair damage and pay compensation. Community representatives, however, voted to refuse the government’s offer before the Court issued its ruling. On July 25, 2012, the Inter-American Court of Human Rights issued its ruling in the case, stating that the State of Ecuador was responsibile for not having previously executed free, prior, and informed consultation with the indigenous community of Sarayaku, in accordance with international standards. The Court found the State responsible for violating rights of the community of Sarayaku, their ancestral lands and cultural identity, for not granting effective legal protection, and for having placed their life and personal integrity in danger in the presence of seismic explosives within their territory. The Court’s verdict will be compulsory for the Ecuadorian government, and will have large repercussions for the intense debate that has been raging in the last few years about the scope of the right to consultation and territorial rights of indigenous peoples. Pachamama Alliance honors the courage and perseverance of the people of Sarayaku, along with our other indigenous allies, in the face of immense pressure from entities that prioritize other interests above those of living communities. We invite our global community to bring similar courage to working with us for a just, thriving and sustainable future.